Time-to-diagnosis and accuracy of treatment are paramount to case management, as well as infection control, the fight against multi-drug resistance and reducing animal healthcare costs. As a veterinary microbiology laboratory, your primary goal is to deliver the most pertinent results as quickly as possible. At bioMérieux, we share this goal, and all our energy is mobilized towards gaining precious hours, minutes and seconds in obtaining a reliable result between the time of sampling and the test result. 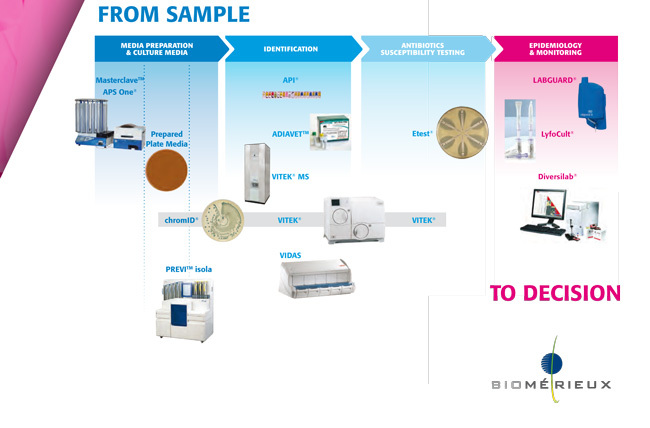 Depending on your laboratory set-up this process can be based on manual technology (API®, Etest®, ATB®) or automated technology (VITEK®, ChromID®, Previ™ Isola) including relevant technologies for the microbiology field (MALDI-TOF, molecular diagnostics).